Time to fix the patent system. In this blog, I’ve argued that the current patent regime retards overall innovation. It’s not aligned with empirical studies of creativity research. Patents are awarded to a single entity, as if that entity is completely responsible for the advance in knowledge. But research shows that all innovations are collaborative and distributed. Defenders of patents will say: First, the potential reward of a patent provides an incentive to innovate. Why invest all the money in researching a new cancer drug if you don’t get the exclusive rights to market it? Second, in exchange for being granted a patent, you’re required to make your innovation public. This is supposed to help everyone else move forward faster with their own innovations. The patent system rewards huge companies with deep pockets and lots of expensive lawyers. It blocks startups and entrepreneurs. Maybe there are exceptions? For example, pharmaceutical patents that emerge from university research labs, with a startup that’s funded by the university’s research office? But aren’t universities also big institutions with lots of lawyers? Patents do nothing for the little guy. Patents are granted for too long. No technology company needs 20 years of protection for their idea. How many of you still own computers from 20 years ago? Patents are granted for “new” “ideas” that are much too obvious: does Apple really have a patent on “rectangular tablets with rounded corners”? (Apparently, they do.) And yet, U.S. patent law says that to get a patent, your idea has to be non-obvious. I’ve written about problems with the non-obviousness doctrine here, and it’s a big topic of discussion among IP lawyers and scholars. Sharing brings huge benefits to society. Sharing leads to extra innovation. Ideas overlap. Inventions depend on earlier creative advances. There would be no jazz without the blues. Innovation today is less about entirely novel breakthroughs, and more about the clever combination and extension of existing ideas. Because this legal fight blocked American innovation, the collaborative web instead kept innovating in Europe, where the Wright brothers weren’t able to enforce their patent. British, German, and French airplane industries were booming, with constant innovations leaving the Americans behind. In my public talks, I often show photos of the airplanes being built in Europe; they look like modern planes. Then, I show a 1914 photo of the Wright brothers’ plane; it has barely changed from 1903. In 1917, when the U.S. entered the war, the U.S. government forced the Wright and Curtiss companies to form a patent pool with open sharing. Nowadays, both the number and the nature of lawsuits involving software, hardware, and even design minutia are testament that patent law remains the damper on innovation that it was when airplane development was nearly grounded in its infancy. *Goldstone, L. 2014. “How a Patent Fight Grounded the Wright Brothers.” Wall Street Journal, April 9, p. A13. Today’s Wall Street Journal reports two new developments in U.S. IP law. First, on Saturday March 16, the U.S. Patent and Trademark Office (PTO) is dramatically changing its patent system, from a “first to invent” to a “first to file.”* Under the old first-to-invent system, if you could document that you were the first person to come up with an idea, you got the rights to that idea–even if someone else had filed a patent for that idea first. So what’s wrong with that? It sounds logical: if you thought of it first, it shouldn’t matter that you didn’t run to the PTO before everyone else. There are two problems: First, every other country in the world uses a first-to-file system, which means if you filed first for the patent on the idea, it’s yours, no matter who can prove they really thought of it two years before you did (from their lab notebooks or whatever). In an increasingly international economy, having our patent system align with the rest of the world is a big deal. Second, under first-to-invent, imagine how complex the court cases get, when some inventor somewhere says that they actually thought of that idea five years ago. Then, lawyers are poring over old lab notebooks and reading hundreds of emails. It might sound simple: All you have to do is find the email that contains the idea on a certain date–but in fact, it always takes a lot of complex interpretation. Was this lab notebook sketch really evidence of the idea? Usually, it’s close but not quite exactly the idea that’s in the patent. Many inventors think their idea really was this idea, but everyone thinks their idea has a broader scope than it really does under patent law. Companies have been spending billions defending themselves against patent lawsuits, and this change is intended to reduce the litigation. The second article** talks about copyright protection on sound recordings. The Library of Congress wants to convert their old (and decaying) sound recordings to digital, and then make these digital versions available to their patrons. And it turns out, that’s illegal for something like 177 years after the recording was originally made. The copyright protection even for the oldest recordings, made when the technology was first invented back in the 19th century, will not end until 2067 at the earliest. In Europe, in contrast, sound recordings enter the public domain 50 years after their initial release. The more I learn about IP law, the more I realize it’s a huge complicated mess. I’ve been impressed with my IP law colleagues, negotiating complex issues at the intersection of law, economy, and psychology of creativity (hence my involvement with the issue). But as I concluded back in 2007 in my book Group Genius, patent and copyright regimes today are too restrictive, and this is reducing societal innovation. I’ve just participated in a small conference on copyright and patent law, hosted by the American Law Institute and Georgetown University Law Center, a few steps from Capitol Hill in Washington, DC. Of the 40 people in the room, I was the only one who was not a lawyer or a legal scholar—I was invited to contribute perspectives from creativity research. 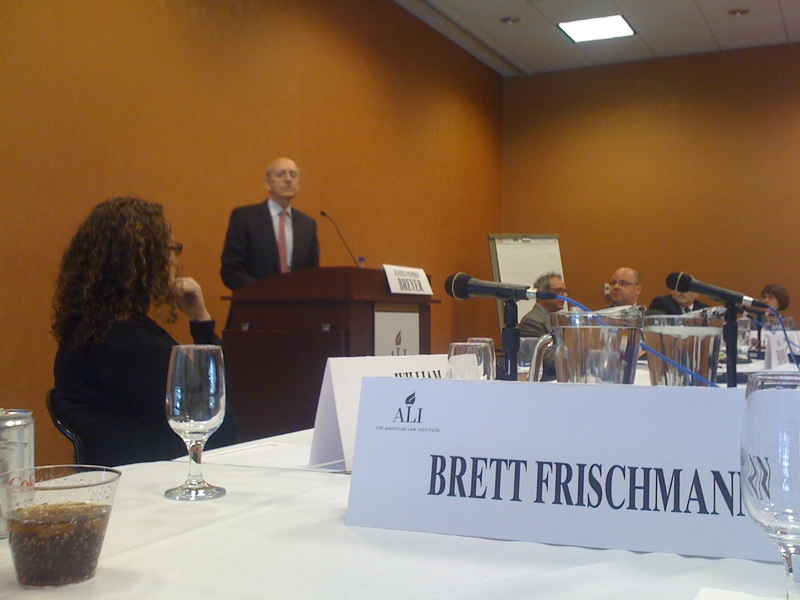 I was honored to be in the room, because these were some of the most highly respected people working in intellectual property—scholars from Stanford and NYU; senior legal counsel from Google and Walt Disney; judges on the Federal Circuit Court; and our lunch speaker, Supreme Court Justice Stephen Breyer. He impressed the hell out of me…a great speaker, savvy in the political ways of Washington, and a brilliant mind. The smartest guy in the room–and in this room, that was saying a lot. Branch out: Always start with your core area of expertise—but don’t stop there. Branch out and study subjects in every area that is somehow related to your problem….Successful creators are curious by nature. They ask questions and listen closely to the answers, even when the information has no obvious relationship to what they’re working on at the moment. The panel I spoke on discussed how (and whether) patents and copyrights provide incentives to creators to create. The research shows, not very much. Creators almost never think about patents or copyrights; when they do, they mostly get annoyed and consider them to be a hassle. Lots of creativity takes place in areas which are not eligible for patents or copyrights—from top chefs inventing new recipes, to the time-consuming and effortful work of writing fan fiction. Do judges even need to pay attention to what these scholars think patents and copyrights should do? After all, isn’t the role of a judge simply to interpret the statutes as written by Congress? I was a bit surprised to discover that pretty much everyone in the room thinks this is naïve and simplistic. The statutes are thought to be broad and ambiguous, open to interpretation. And after ten or twenty years, things change so much—and so much case law develops—that the statute really isn’t that helpful any more. Justice Breyer was asked, “We have a bumper crop of IP cases before the Supreme Court; is there an increased interest in these issues?” Breyer’s response was that the legal community has been saying that the Federal Circuit Court (which handles all patent appeals for the entire U.S.) has become “too patent friendly,” and the Supreme Court is listening and essentially, checking to see if that’s true. A common theme was the tension between generality and specificity. Patent law is general—it applies to all technologies and scientific domains. One could imagine a more specific regime; for example, the Digital Millenium Copyright Act (DCMA) is a statute concerning intellectual property that is specific (to digital rights and copyrights) rather than general. My sense was that the consensus was in favor of general regime and against specific regimes. A second manifestation of this tension is with the courts; the Federal Circuit Court handles all patent appeals, which means those judges develop specialized knowledge about patents. Before the Federal Circuit was created, patent appeals were heard in the regional District Courts, by judges who heard appeals of every kind of decision—a more general role. Most scholars seem to think this is a good idea, although the Federal Circuit has been widely criticized, as Justice Breyer noted, for being too patent friendly. The stated theme of the conference was “bringing together copyright and patent law in court,” and I’m not sure we got any good answers for how to do that. But I probably only think that because I’m not part of this legal community; the folks I met there told me that copyright experts and patent experts are like people from two different planets, who rarely come together. In the courts, the Federal Circuit handles patents and the District Courts handle copyrights. So I’m pretty sure the conference organizers would consider the event a success, simply by getting copyright people and patent people in the same room together. I stayed one extra day, and toured several museums. 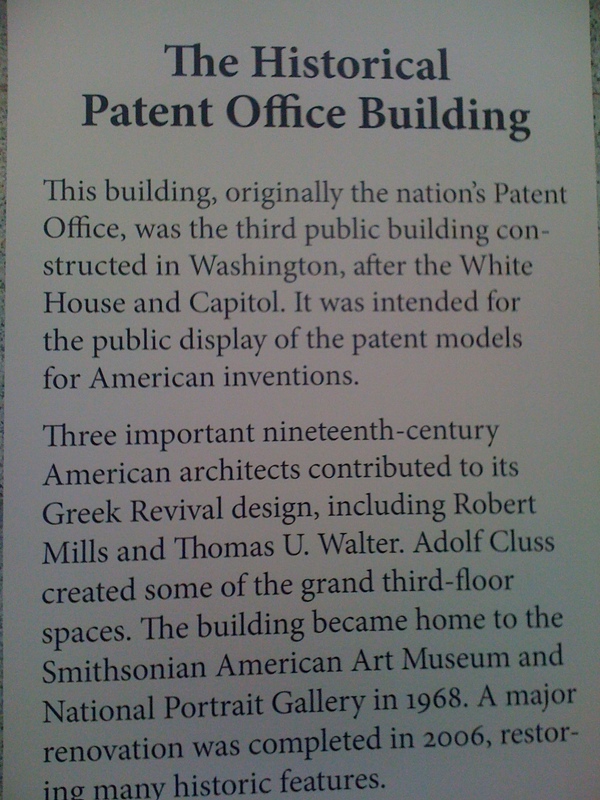 The high point was visiting the old Patent Office, just a few blocks from the conference, which had a special exhibit of historic patent models from the 19th century. The building also houses the National Portrait Gallery and the Smithsonian Museum of American Art. And–it’s a bit geeky–but I also loved the Postal History Museum, in the old post office building right next to Union Station. If you want to learn about facer-canceller machines, or about the handmade artwork in old cancellation stamps, this is the place for you! 1. The Palm Treo 650 had clickable phone numbers in emails. When you implement the same idea in a web browser, does that really deserve a patent? No. It’s obvious, and patents have to be “nonobvious” according to patent law. 2. If you aren’t convinced that this is an obvious idea, take a look at this online web forum of Palm Treo users from 2005. Everyone is saying “This is so obvious! Why doesn’t Palm implement this?” And apparently, you could download an app that would make phone numbers clickable in most of your Treo apps. As I pointed out earlier this week, Palm Treo did it first. I admit I’m not an expert in this; perhaps Apple purchased Palm’s patent? Is there some legal basis for arguing that Palm’s clickable email phone numbers are somehow different from the above language? In other news today (Friday August 31, 2012) a Japanese court ruled against Apple in its lawsuit against Samsung. This fight was over a completely different patent than the seven at issue before the California jury: Apple had a patent on a technique for synchronizing music and video data with servers. I remain convinced that Apple will eventually lose, on the grounds that many of these patents are invalid due either to obviousness, or because the ideas already existed in devices that predated the iPhone. I just returned from a fascinating event at Notre Dame Law School, the Creativity and the Law Symposium. Organized by Professor Mark McKenna, the symposium consisted of 14 presentations, most of them by intellectual property (IP) lawyers who are looking to psychological science to learn how IP law can best foster creativity and innovation. The first thing I noticed was that all of these legal scholars accepted an instrumental view of IP law: that the purpose of IP law (which includes patent, copyright, and trademark) is to foster maximum societal innovation, for the good of all. I didn’t hear a peep about a competing view that you might call the property view: that my ideas and creations are my personal property, and I have an inalienable right to own them, just like I own my house or my classic BMW motorcycle. That’s fine with me, because I also believe that IP law should be designed to foster the maximum creativity of all. My own studies of creativity demonstrate how each new creation is always a rather small advance on the large body of knowledge and expertise that has come before, so being overly possessive about your own ideas is always an error. Two information conversations stick in my mind: One with Professor Greg Mandel, of Temple University, who told me that many legal scholars had begun to draw on psychological research to inform the law. This move across disciplinary lines is similar to an earlier foray into economics; economics scholarship (particularly microeconomics and behavioral economics) has been influencing the law for some time now. Greg’s paper introduced the day’s symposium, and he drew on the sort of psychological research that I review in my book Explaining Creativity. A second was with Abraham Drassinower, of the University of Toronto. In our conversation, we reflected on this whole endeavor, asking the question: What are the real-world implications for the law, of psychological research? After all, throughout history, law has never been based on scientific research. It has always been based on normative claims about human relations, it always involves culturally specific conceptions of the individual and his or her relationship to the collective. In my talk, I described the “Western cultural model of creativity” and ten associated beliefs that are widely assumed in the United States (but which are not supported by research). I drew on the group genius of the assembled legal scholars, and for each of the ten beliefs, I asked them to tell me how current IP law was, or was not, based on these assumptions. I share the approach of my legal colleagues: Our goal should be to align IP law with the way that creativity and innovation actually work, as revealed by empirical study. I was delighted to participate in this stimulating event.